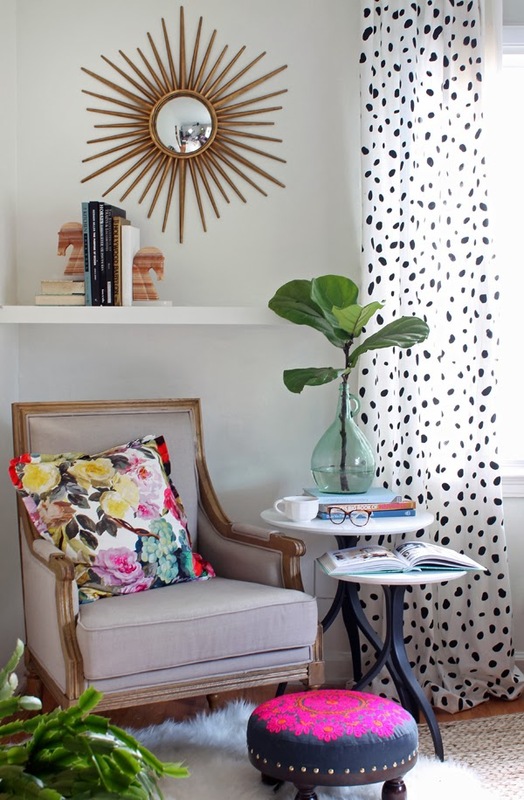 You all know by now that I am a sucker for spots… I have been dying for some spotted drapery panels for a while, but was so bummed when Premiere Prints dropped their Togo pattern. It was by far the best & most affordable option. Especially for the amount of yardage needed for drapery. That’s when a little lightbulb went off over my head! I’ve painted drapery before… I could certainly do it again. I contacted Royal Design Studio & voiced my need for a spectacular spotted stencil & they agreed to create one! The best part is we were able to play with the spot design & make them a little more animal like vs ovals. A nice hybrid between Thaibut’s & Premiere Prints. As soon as the stencil was approved, they sent it my way & I got to work! These beauties take some time… but are so worth it in the end. My favorite part about this stencil is the fact that it is so organic that if you get crooked or happen to spill or smudge the paint, you can simply reposition the stencil or add an extra spot. Foolproof I tell ya! I completed four panels with two 8 fl. oz. bottles of craft store acrylic paint with just a drop or two to spare. And like the last time (remember this project?!?) I used my Martha Stewart Stencil Brushes from Michaels. Want to know the best part??! This stencil is now available from Royal Design Studio Stencils! or simply click on the Lamps Plus badge on my sidebar. Wow, Kristin, I've always loved that pattern! As they say, "Ask and you shall receive!" Way to go, thanks for the inspiration! Oh Kristin… I love this and love your pictures even more! Beautiful…and so you! What a fun and creative venture to design your own stencil…and produce such fabulous results! Love love love love!!! And your styling and photography skills are killing it, too!!!! What a FABULOUS project! I will be using this very soon! Awesome! Love the black and white – wait, do you like B&W?? 😉 – and the pattern is spot on (couldn't help myself there). But seriously, it is. Wow, this looks amazing! So inspiring! OMG Kristin – you're my hero! I wrote to you awhile back about the gold dresser used in the rehab project and lamented the loss of Togo fabric in our exchange. This is GENIUS! I'm also planning on using the Thibault wallpaper in my office reno, but I'd much rather stencil as it's easier to change. Love you forever for this. Mean it. wow! That is a perfect solution to a fabric discontinued!! 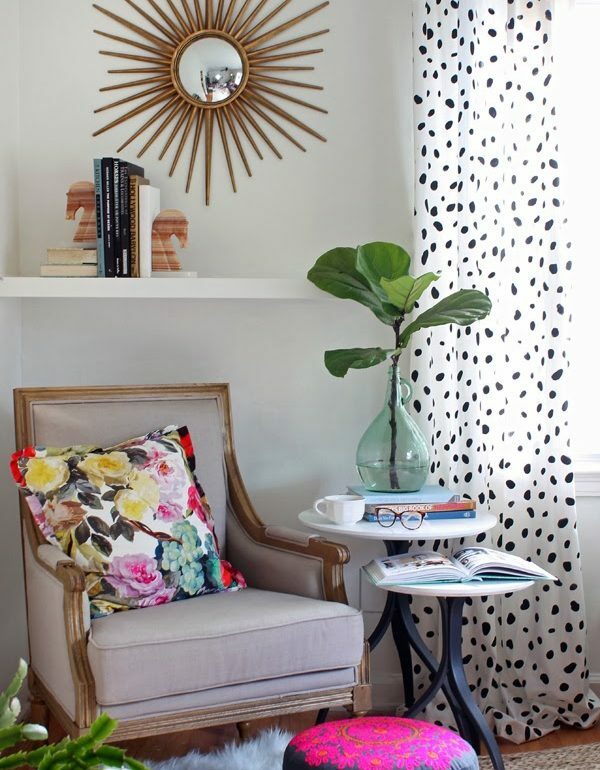 I love the spots to and the pattern looks stunning on the white walls!! Came out great! I did stenciled curtains for my mom a while back. Tedious process, but love the results! You can never go wrong with a monogram! Love a good monogram. C.Wonder and Mark & Graham always have great options!! I love a monogram as well! These are all great hostess gifts! 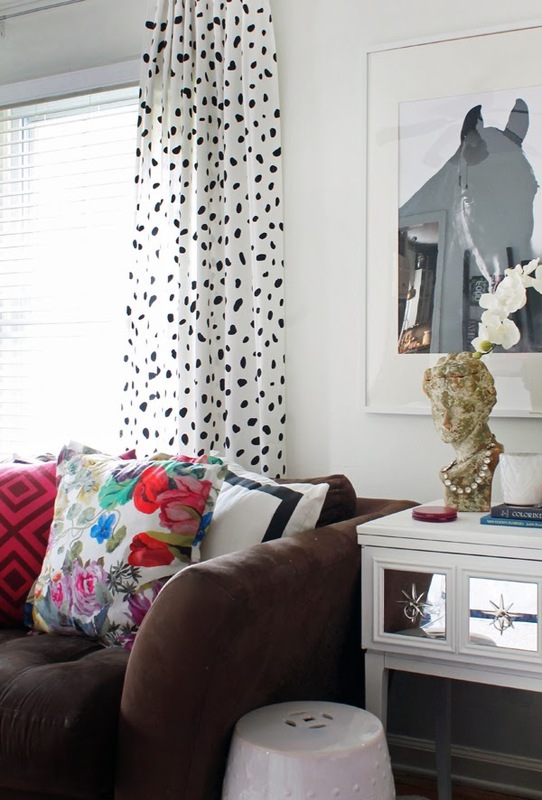 Love the curtains but also love that floral throw pillow! Can you tell me where it's from? Monograms are my favorite. Such a classy hostess gift too! 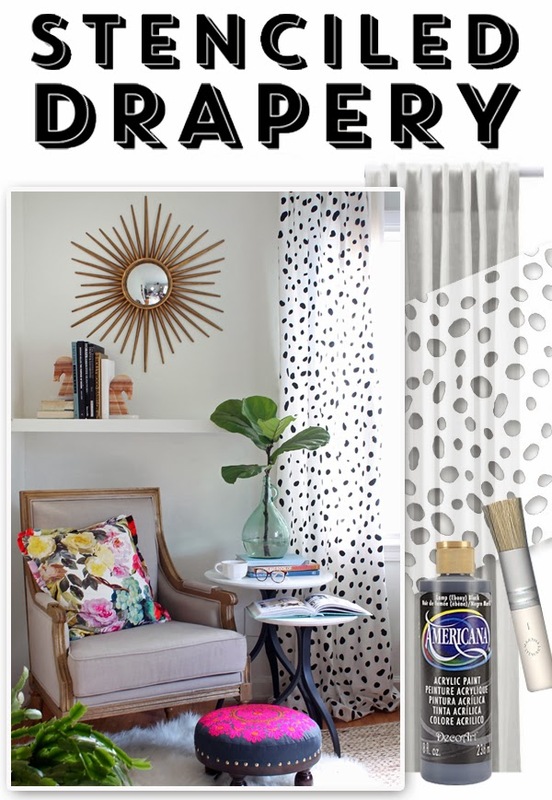 Your drapes look amazing…I am obsessed with spots too! Fab job! 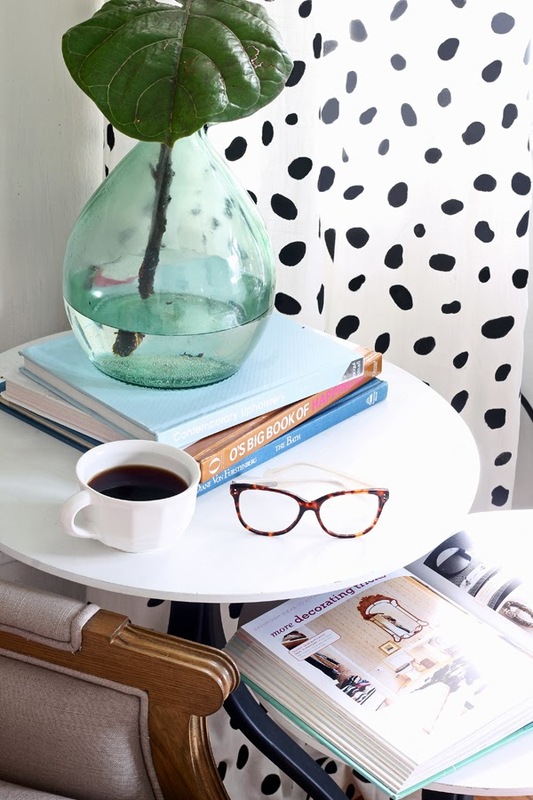 Black + white + spots= you can never go wrong!! They look amazing and how awesome that you got to create it! So awesome! Wow great tutorial, will give this a go. I love your gold mirror – where did you get that please? I just love this so much. I need some more Cheetah spots in my life too! Those look super duper fly girl, way to get after it!